Is the AWS server management responsibility overburdening you? Don't let this burden affect the productivity and revenue of your business. As our team of technical experts handles your complete AWS server. At MilesWeb, you get complete management for your AWS. We make your experience with AWS absolutely seamless as each and every aspect of your AWS server is taken care of by our experts. Already have AWS Cloud but need management? Make your Amazon cloud journey smooth by handing over the tedious job to us. You manage your business while we manage your AWS. We let you focus on your business administration by dealing with your AWS technicalities. We have a certified team of experts to manage your AWS. They know how to take ahead your AWS server to make it secure, powerful and hassle-free. All the server related tasks like updates, patching or other daily operations required for AWS management will be done by our team. You can contact our team at any hour. They will be ready to assist you 24/7/365 for your AWS related queries. To keep your AWS server up and running at topmost extent our team will continuously monitor the traffic spikes, possible infections and other issues. To embrace the cutting-edge AWS services, we enhance your AWS server together with performance, expenditure and security. Rather than being concerned about administering your AWS cloud platform, let your team perform on what they are best at- building products, making profits and assisting customers. Why choose MilesWeb for your AWS management? By getting your AWS server managed from MilesWeb, you get numerous advantages such as reliability and flexibility which makes us the preferred choice for most of the businesses. Since we have experienced working with startups and well-established organizations we know the challenges you might face in your growing business. Besides, we also know how to handle those. Most of the companies find it difficult to move to a cloud. But that's not the matter of concern anymore. Because at MilesWeb we guide you throughout the entire process for your AWS server. No matter if its AWS management or AWS consultation you can fully trust us, as we will be there from beginning to end during the whole of your cloud transformation and more. We ensure that you get a powerful platform for your AWS server along with strict compliance with rigorous security. What makes us the preferred choice for your AWS? If you are new to AWS, migrating to their server can be stressful and complicated. With our proven methodology and expertise, we can help you cut-off any risks while you begin your journey with AWS. Your main purpose of moving to the cloud is reduced cost. Thus, your AWS will be analyzed regularly so as to help you reduce the cost of your AWS cloud. With the help of the advanced caching technology, your AWS is optimized and enhanced to deliver better performance as your need expands. Our well-built combination of capable AWS experts and tools used for management helps to safeguard your server and the data stored on it. Based on your business needs our AWS certified experts will build solution architects for your AWS environment. We have a certified team of experts to take care of all these tasks. Cloud computing is one such element that cannot be handled all alone along with managing your business. Years of training and experience is required to master cloud computing. Luckily you don’t have to be worried about investing so much of time learning about it. MilesWeb caters AWS deployment, consulting and management services that gives you a peace of mind knowing that your AWS is in safe hands. Our team will carefully work with your business and understand the business operations along with complete infrastructure plans. We build process and principles that are required to adopt best practices for your framework. All this is done by balancing execution and price. What does managed AWS services include? Our managed service includes everything, right from deploying, maintenance, monitoring to running applications in the cloud. What technical support does MilesWeb provide? MilesWeb provides 24/7/365 technical assistance on phone, email and live chat. Do you provide Amazon cloud server management? Yes. We do provide complete management for your Amazon server on cloud platform. We support all flavours of Windows and Linux/Unix operating systems. The control panels we support are: cPanel and Plesk. Can one launch multiple Amazon cloud instances? Yes, you can launch as many Amazon cloud instances as you want. If I already have an Amazon cloud account, can I use the same? Yes. You can use the same Amazon account. Can Amazon cloud be used for hosting my e-commerce stores? Absolutely! Amazon cloud is specifically built for high-traffic websites that need highly reliable servers. Can my Amazon cloud account be scaled? Ofcourse! You get the ability to scale your cloud vertically for your Amazon cloud. Are there any separate charges for Amazon cloud services? You just have to pay for managing your AWS server at MilesWeb. The Amazon account you have purchased will be charged as per their billing cycle. Does AWS provide an option to choose your own data center? Yes. 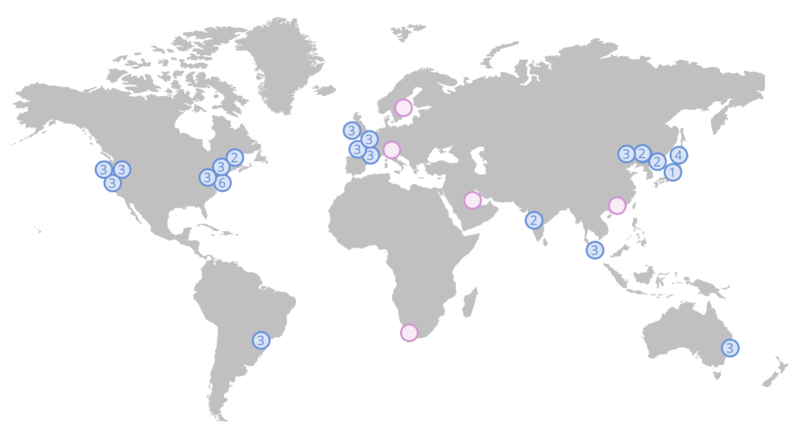 While you launch your AWS, you can choose the data center location of your preference. Have questions? Talk to our experts! Once we put heads together on your current architecture, our specialists will walk you through perfect techniques to secure, manage and monitor AWS.